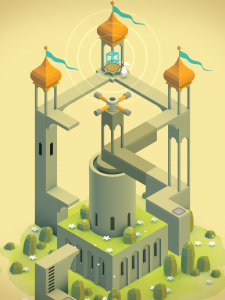 I just spent a very enjoyable and Zen-like two hours with Monument Valley on my iPad. 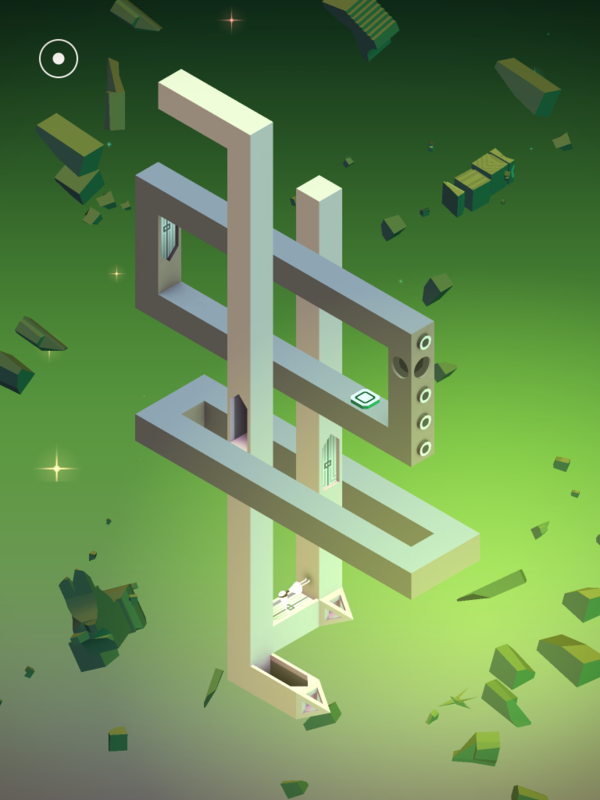 It is a new, arty puzzler that brings to mind Escher, Journey and possibly Fez. It enjoys playing with your brain by playing with perspective. As a pointy-hatted princess, you have to make your way around structures that could not exist in the real world. To do so, you have to rotate levers, which may alter the environment, raise and lower paths, step on tricky-to-reach switches and befriend a blinking, yellow totem (!). If two paths don’t actually connect, but you can manipulate the view in such a way that they seem to line up, you can now actually walk across from one to the other. It is not an entirely new concept, but is done very well here. You will pleasantly struggle to grasp the impossible bending of space, but you won’t be stumped. There was only one instance where I was stalled for a longish amount of time, because I didn’t realize that lifting a lid from one end would reveal something else beneath it, than lifting it from the other end. My sense of reality was getting in the way of my embrace of surrealism. 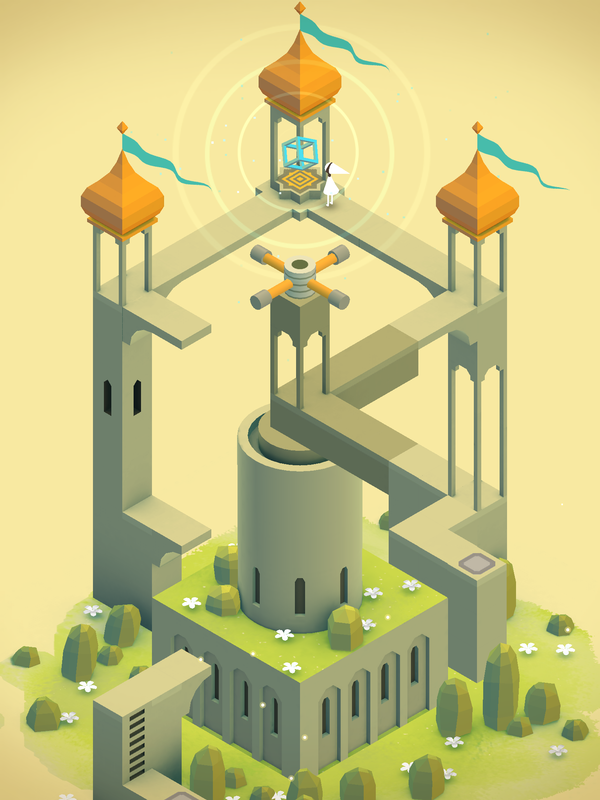 Monument Valley is a very short game with only ten – beautifully designed – chapters, so it won’t take you long to finish; about an hour or two. 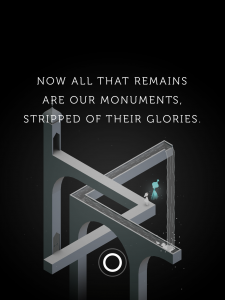 But the stylish, charmingly simple graphics, the poetic hints suggesting a melancholy backstory, the relaxing music and – of course – the surreal puzzle-platforming, make for a great experience. 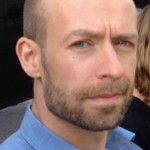 I guess some people will object to the relatively high price for such a short mobile game, but if you’re someone who values quality over quantity, then picking this up is – ironically – a no-brainer.